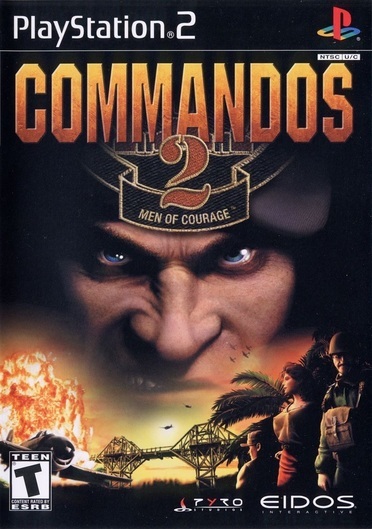 "Commandos 2: Men of Courage" is a tactical action-strategy game set against the backdrop of World War II. You'll take control of an elite group of commandos who must venture deep into enemy territory and utilize their combined expertise to complete a series of mission-based objectives. You'll covertly enter new environments based on authentic WWII locations, including the heart of the Third Reich, a northern European submarine installation, the headquarters of the Japanese army, and more. You will interact like never before with the environment: stealing enemy uniforms and weapons, climbing poles, swinging from cables, swimming, utilizing vehicles, and climbing in and out of buildings, ships, and planes. You will control nine commandos, including a green beret, sniper, demolitions expert, seductress, thief, and even a dog. The game features an all-new 3-D engine, allowing you to rotate the environment 360 degrees, move seamlessly in and out of buildings, submarines, planes, and water, and zoom in and out when viewing the environment. The innovative camera control allows simultaneous control of multiple gameplay windows in real time. "Commandos 2: Men of Courage" includes 10 missions spanning nine different night and day environments with realistic weather effects. Go to war with others in a cooperative multiplayer mode, and use new WWII vehicles and weapons such as jeeps, tanks, trucks, ships, bazookas, and flamethrowers.